This highly entertaining novel works on the strength of its detailed mythology and strong storytelling. O. H. Kopole’s Before the Big Rains is an epic, sweeping parable of good versus evil, a cautionary tale in which a sibling rivalry gone wrong threatens to undermine the traditional institutions of an African village and bring on ecological disaster. Sera murders Paramount Chief Thaga and, as interim leader, rules the village by greed and ruthlessness, incurring the wrath of its gods and subjecting it to a decade-long drought. Meanwhile, Thaga’s son and sole heir, Lefa, and his mother, Ngwakoana, escape to a neighboring clan to await the day when Lefa can claim his rightful place as leader. The strength in Before the Big Rains lies in its storytelling, which takes meticulous pains to establish a lush and deeply affecting landscape drawn from African mythology, cultural traditions, and political institutions. The parallels to current real-world issues are starkly foreboding: drought, caused by destructive agricultural practices and attributed to angering the gods; greed and unilateral loyalty to self rather than country; the divisive politics that result from governing by fear; and the use of religion to justify political objectives. The text’s moral lessons are considered from differing viewpoints. Deeply paternalistic social hierarchies are enforced to give the story its underlying conflict, although most of the tensions that develop from chapter to chapter resolve neatly by a chapter’s end. Character development is consistent, especially within the story’s Cain and Abel narrative. Clear lines—personality traits, words, and actions—are drawn between good and bad characters, and between the wise and the foolish. Personalities do not change much in the course of the story. Primary characters disappear for long stretches, while secondary characters, such as Oldman Kota and the maleficent medicine man Majafela, receive considerably more space. 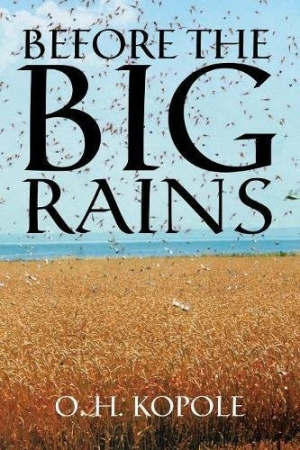 Before the Big Rains is a well considered and highly entertaining novel that works on the strength of its detailed mythology and strong storytelling.